Every year the independent investment research provider BCA organizes an outstanding event for investment professionals from all over the world to come together and have a vibrant discussion about recent challenges in financial markets. This year’s conference was held in Toronto, dedicated to the core topic on how to navigate client’s wealth to prosperity in a late stage of the business cycle. One of the key questions was whether the central bank will cause a recession via substantial hikes in the key interest rate as has happened in previous episodes. Exactly 10 years after the financial crisis hit the markets, the impact it had on society and people’s lives seems to be like a haunting ghost which is hard to get rid of. Even though we observe economies beyond full employment, wage growth is limited leaving economists questioning their confidence in familiar models like the Phillips Curve, which suggests an increase in wage growth when the unemployment rate is low. It should be obvious that something new needs to be factored in. A suggestion might be uncertainty and anxiety about future economic and political developments. Furthermore, companies are gaining more power due to greater concentration within industries, as well as technological improvements and developments like Artificial Intelligence and Robotics. As a result employee’s bargaining power is diminished. The link between wage growth and employment has been partially broken and is still waiting to be fully restored. In order to underpin the argument of inflated uncertainty the following chart is provided. What we can see here is clearly a structural break in the US consumer behavior. 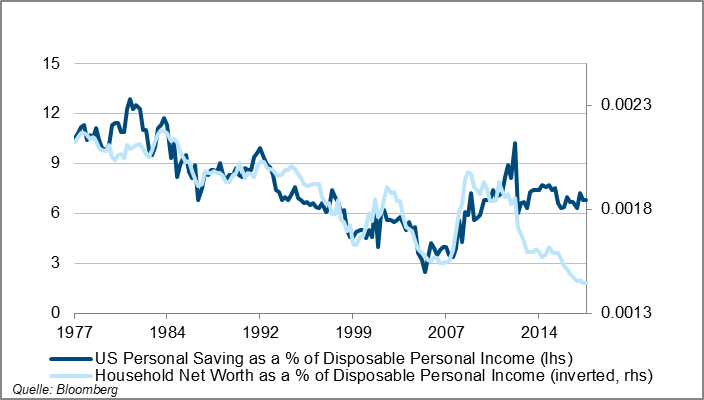 Even though household net worth (inverted) is increasing significantly, personal savings and subsequently real personal consumption are not following the same path anymore. This means, consumption is not as strong as the increase in wealth would suggest. It is actually keeping inflation on the low end which might give the central bank (Fed) enough room for its policy to be mildly restrictive. As long as price stability is given, the Fed can keep focus on its path to normalization. The US Federal Reserve Bank was the real driver of economic activity over the last decade, fueling markets with cheap money to tackle the aftermath of the financial crisis. Lately the policy shifted from quantitative easing to tightening and in many aspects it is a Hercules task. Debt levels are much higher than we’ve seen in the past, resulting in markets being more sensible than ever to interest rate changes. Moreover, the global feedback in asset prices and FX channels gained drastically in importance for central banks. The Fed is finding itself in the dilemma of keeping balance between preventing US markets from going into recession and pacing its tightening process to the economic environment, preferably keeping it constant. And so far, the US central bank has been quite successful unwinding its balance sheet moderately. Janet Yellen made this point clear by telling the audience, for her it is like watching paint dry and only a significant deterioration of economic activity in the US would see a change in the Fed forward guidance and consequently in its interest rate policy. In conclusion, consumption and wage growth might be the key to prevent or cause the American economy from overshooting. I recommend keeping an eye on those figures. Once the uncertainty fades and the consumption gap will close in addition to wage growth acceleration, it might result in a deadly cocktail of inflation giving the central bank no other choice than being severely more restrictive. In the end, this scenario wouldn’t be so different at all!